The Twenty-First Judicial District Commission on Judicial Performance, by unanimous vote of nine voting members, recommends that Judge Brian J. Flynn BE RETAINED. 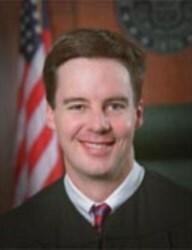 Judge Flynn was sworn in as a District Court Judge for the Twenty-First Judicial District in January of 2005. He received his undergraduate degree from the University of Colorado in 1989 and his law degree from Widener University in 1992. He worked as a Deputy District Attorney in the Twenty-First Judicial District from 1993-2005. Judge Flynn promotes the justice system in the community by having served as a mock trial judge for high school students, the Western Colorado Peace Officers’ Academy (WCPOA) and Colorado Mesa University (CMU). He does presentations on the law at high schools, WCPOA, CMU and to students who visit the justice center. He served on Senator Mark Udall’s Merit Selection Committee for Service Academy Nominations. He participates in various committees through the judicial department to improve the justice system. Judge Flynn presides primarily over criminal matters but also presides over domestic relations, civil, mental health and probate matters. Attorneys described him as tough on sentencing but a very fair trial judge. He has been described as generally very knowledgeable on the law and a very hard worker. It was noted that his experience in civil matters is somewhat limited. His demeanor in court and the dignity with which he conducts business was noted by attorneys and non-attorneys alike. Non-attorneys described him as listening to all sides and being very professional and fair. The committee found Judge Flynn to be respectful to all parties, hard-working, innovative and open to change. The committee felt that Judge Flynn has been very responsive to criticism that occurred early in the evaluation period, made changes in response to it and has grown tremendously as a judge as a result. The committee considers Judge Flynn an asset to the bench.